I’ve been exploring the practice of media literacy education in early childhood settings. One important concept that I like to introduce to preschoolers is the idea that media messages are constructions– they’re made by people who make choices. Of course, all acts of communication involve a set of choices. The decision to lie or tell the truth is a choice that’s highly relevant to young children, and researchers are helping us see the developmental trajectory of this particular competence as a social skill. Children naturally seek out information, but young children lack the ability to decide who and what are trustworthy sources. Learning when to trust and distrust other people is an essential early skill, as that information enables children to begin the lifelong process of filtering and applying things they learn to their understanding of the world. She describes research from the September/October issue of Child Development where psychologists at the University of California, San Diego, found that children begin to learn about distrust around age three, but cannot apply that sense of distrust until around age five. 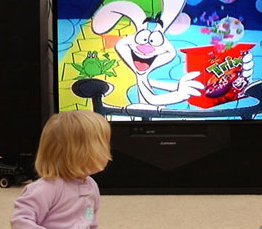 Media literacy educators frequently explore the genre of advertising with young children because it’s ubiquitous in their lives and provides an opportunity for them to recognize characteristics of persuasive messages. In fact, some children under age seven can make inferences about the author’s motive and purpose, when the genre is familiar to them. Parents and teachers may approach this issue differently, depending on their existing attitudes about advertising. Some parents and educators may conceptualize advertisers as the “tricksters” while others will not see it very useful to frame advertising as essentially a form of lying. Both groups generally agree, however, that children need to recognize that information and emotional responses are shaped by the choices made by advertisers aiming to persuade. But as the developmentalists note, it’s one thing to be able to recognize and identify an trustworthy and an untrustworthy source. It’s another thing entirely to be able to disregard untrustworthy sources. That’s not easy. In fact, we could argue that this phenomenon persists into well into adulthood, as voters may recognize the false and misleading political campaign advertising (given that it’s normative to the political process), but still be influenced by it in making their choice at the ballot box. For most people, it’s actually pretty difficult to disregard untrustworthy information. One of the reasons why media literacy has such useful potential as a community education movement is that awareness of the process of identifying trustworthy and untrustworthy sources and using information appropriately based on source credibility are competencies that apply across a wide range of stakeholders and contexts across the lifespan.